Dynamically bound systems are those software systems which are able to incorporate executable components into themselves during execution. Such systems are clearly very flexible; however, they suffer from problems associated with this flexibility. These problems, which are similar to some of the problems addressed by configuration management, include how to locate and select components, how to manage change to components, how to verify the consistency of configurations of the systems and how to determine the actual system configuration. This paper describes some of the systems which support dynamic binding and discusses some of their associated problems. An approach to the design of configuration management facilities for dynamically bound systems is then outlined. 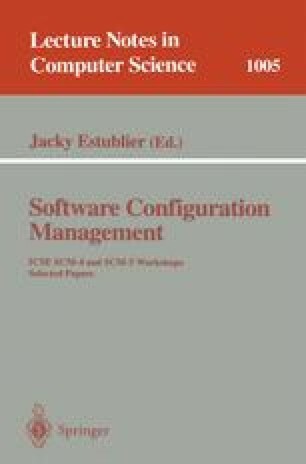 This approach involves the detailed modelling of dynamic binding in a range of systems supporting this notion and the integration of this model with the relevant aspects of a model of configuration management developed by Wiebe. Finally, the paper foreshadows some ways in which the previously mentioned problems with dynamically bound systems can be addressed.